Wentworth Recruiting promises “Uncommonly excellent recruiting at a very reasonable price.” And they deliver: For more than 350 clients, 97% of their assignments were concluded successfully, and 96% on time, across virtually every discipline and industry. To produce such impressive results cost-effectively took a highly disciplined, efficient process. To improve on their success, they wanted to make the system even better. Wentworth hired Scientific Selection to build a more rigorous, test-based approach to screening and assessment. 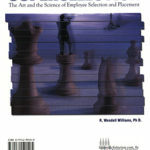 Dr. Wendell Williams, the company’s founder and a well-known assessment expert, recommended a comprehensive selection system based on the Attitudes, Interests, and Motivations (AIMS) tests. These assessment tools reveal often-hidden characteristics that research consistently links with job fit and performance. As the recession ended and companies resumed recruiting, the firm grew rapidly from 9 to 22 professionals, almost all new candidates were assessed using the test package. Every recruiter who was hired using the tests is still on the job and doing well. The real proof of the system is in who’s not there. During a crunch time, two new hires were quickly brought on without going through the process. Both were gone within a week. Based on the success of their own experience, Wentworth decided to give their clients the benefit of Scientific Selection’s expertise and assessment tools. One key client was a major automotive retail firm. In their first round of recruiting work for them, Wentworth had seen a fairly typical turnover rate of 31% in the first year. In their second engagement, by applying a new methodology, they brought the rate down to 9%.